"Poetry will take you places"
Why do you like a poem? Makes you feel sad, loving or tender? Reminds you of something in your own life? Or do you like it for some other reason? How are the ideas being expressed? Mark Strand, “Eating Poetry” from Selected Poems. Copyright © 1979, 1980 by Mark Strand. Used by permission of Alfred A. Knopf, a division of Random House, Inc.
Poetry takes practice, like anything you need to work at in order to learn its ways. Take folding a sheet, for example. Remember the first time you tried to make the corners match up? Maybe you helped your Mom or Dad do the laundry as a child, and maybe they held two sides of the sheet and you did a little dance with your arms to get the cloth into smaller and smaller rectangles, until it was folded. These exercises will help you in a similar way. Malcolm Gladwell popularized the idea that in order to become an expert at something you need to do it for 10,000 hours. Let's get started, then. Life is short!! Even though we've already talked about this, the idea of poetry needing to be about lofty subjects is one our inner critic likes to pull out again and again. Don't listen to that critic! Poetry need not be about anything that people like to call profound or earth-shattering. We are all humans, going through human experiences. Poems can be about telling our unique ways of doing this. o Make a list of things that make you happy. o Shape it into a free verse poem. "I Used to Wonder When Happiness Would Come" by Cynthia Woodman Kerkham from Good Holding Ground by Cynthia Woodman Kerkham and published by Palimpsest Press, 2011. -- One form of imagery (word picture) is achieved by comparisons. When a poet surprises you by comparing unlikely things, it helps you form a memorable picture in your mind. Using similes and metaphors is a great way to add description to writing. Both similes and metaphors take two concepts and compare them. -- Figurative language uses images that cannot be taken literally, i.e., abstract ideas. However, this technique usually works best when the comparisons are based on accurate and realistic details. -- Sometimes comparisons are similes-- simply stating that an object or an idea is like something else. Like a bowl of porridge. Skin fresh out of a shower. And all the geology of an elderly face. Are people easy to write about? A metaphor is an implicit comparison between two unlike things that have common likeness. By using a metaphor, the poet generally suggests that one thing is another thing. It is a comparison that is suggested or implied rather than stated. --The poet needs a great number of metaphors, because if ideas are expressed literally, most of the imaginative appeal is lost. The following poem, "Litany," by Billy Collins contains a great number of metaphors, where he is -making fun of metaphors about love, by writing a litany of them. He is speaking tongue-in-cheek about his observations on love, or more tellingly toward his own relationship. Ezra Pound, one of the founders of the Imagist movement in poetry, which began in the early part of the 20th century, rebelled against formal Romantic poetry. He believed that images were everything--that to use exact, direct language made more of an impact than flowery prose. 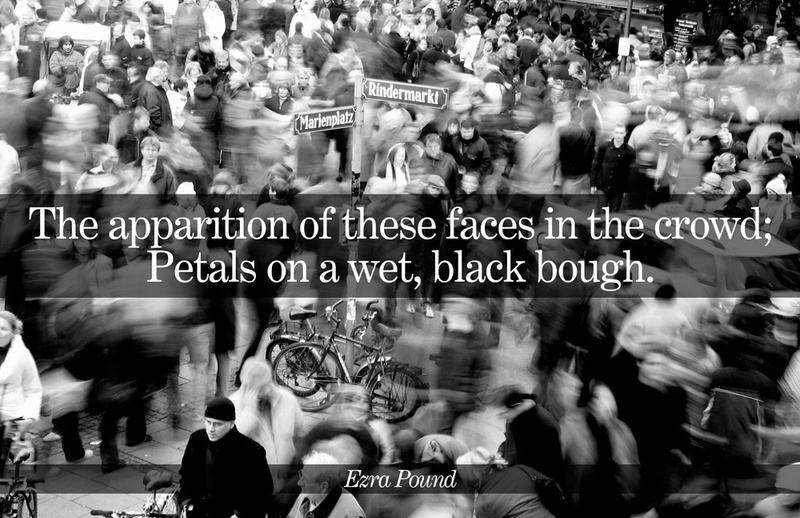 Here is Ezra Pound's two-line poem that uses metaphor, or direct comparison, implying that one is the other. The poem is expressed with such clarity that it is hard to miss the visual impact it has on the reader. As poet, Mark Doty suggests, the poem reminds him of "the sensation of being in a New York subway, the car doors opening, and suddenly there’s a scene framed by the doors," and within the brief but telling lines, the metaphor suggests, " ...that the faces as “petals” were once conjoined. They are the remnants of shattered flowers. There's a sense of a continuum of life, a kind of human brightness. The human face is what blooms, renews, and shines in the dark" (Doty). Poetry Writing #10: What do you see? Write a brief observation of what's around you right now. Can you take that further, compare it directly to something else using the sense of sight? What does it look like? Ezra Pound, one of the founders of Imagism, said that there were three tenets, or rules, to writing Imagist poetry. Direct treatment of the subject. That is, the poem should deal directly with what's being talked about, not try to use fancy words and phrases to talk about it. Use no word that does not contribute to the presentation. Use as few words as possible. 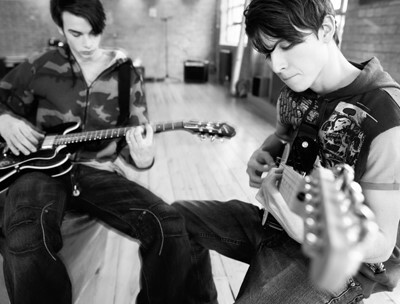 Compose in the rhythm of the musical phrase, not in the rhythm of the metronome. In other words, create new rhythms instead of relying on the old, boring ones. Swallowing a Poem #5 : "Water, Running" & "Fish"
In a bathtub with no plug. Listen to "The Fish" recited by Mary Margaret and click on the title above go to the text of the poem. -- For each of the following pairs, create and develop a metaphor, comparing one to the other. (Don't just say the sun is like a flower; write more about how they are alike). Check out Todd Boss' poem, "My Love for You is So Embarrasingly" where he compares his love for another to the Hindenburg as well as Michael Ondaatje's poem, "Sweet Like a Crow" that is full of unflattering comparisons, using simile after simile to describe a young girls voice. Personification is a type of metaphor. It gives human qualities to an inanimate (lifeless) object or abstract idea. It lends vitality to poetry and permits the poet to give emotions to inanimate objects. In the next poem, identify personification—what is personified? How is it personified? Swallowing a Poem #6: "Window"
Identify personification—what is personified? How is it personified? an unseen orator spoken in mime. that merely loitered in their discontent. -- Use the language in your free write to create an extended personification poem on at least one of these objects.